Ain’t nothing for it but to say they have to stop soon or drop much further. Gold’s low today at $1,129.6 revisits the November 2014 low. Turnaround time. Gold price chart on the right. Nothing points to a turnaround in silver except its nearness to the recent low at $14.62 and last December’s low at $14.165. I reckon I may get my head handed to me on a platter, but I have to stick with it: we’re seeing a seasonal low that will mark the bottom of the long bear phase. We’ll know next week. Rough week for silver and gold prices, down 4.2% and 2.2%, but a good week for stocks, up about two percent. Last hurrah, I reckon. 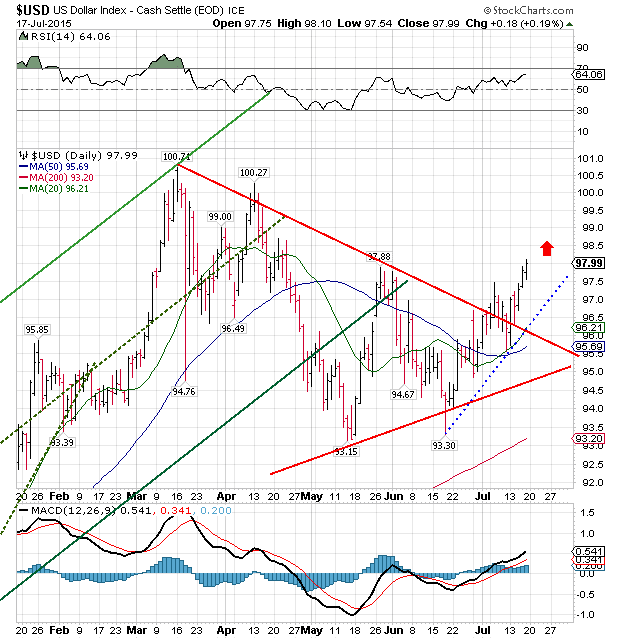 US dollar index removed all doubt about which way it would break: UP. Platinum and palladium are sinking out of sight, and the world is abuzz with a deflation scare. Well, that’s only a boogeyman, but an effective one. Why a boogeyman? Because “inflation” is “an increase in the money supply” while “deflation” is a decrease in the money supply, and you can search the wide world over and you won’t find any country whose money supply is decreasing. Every central bank in the world has responded to the chronic economic crisis since 2008 by creating money in amounts vaster than history knows. What ought to deflate is all the bad debt and bad investment in the world, but that is precisely what the central banks are preventing Rest assured, tuck this into your heart, swing across the vastest chasm safely using this for a rope: if real deflation threatens central banks will create new money until the electrons pop out of their eyeballs. It won’t “jump start” the economy, but it will melt the monetary and financial jumper cables. What the world needs is a debt jubilee, a simple write-off and walk away from all the unpayable debt, and the destruction of the machine that made it possible, central banks and government deficit spending. Whoo! That feels better. Now, let’s look at markets. That nasty, scrofulous, scabby fiat US dollar, that is, the US dollar index, went back and forth this week and finally made up its mind to tip its hand and rise. This week it broke out of an even sided triangle in a move that could carry it to 104. Closed today at 97.81, up 53 basis points (0.54%). 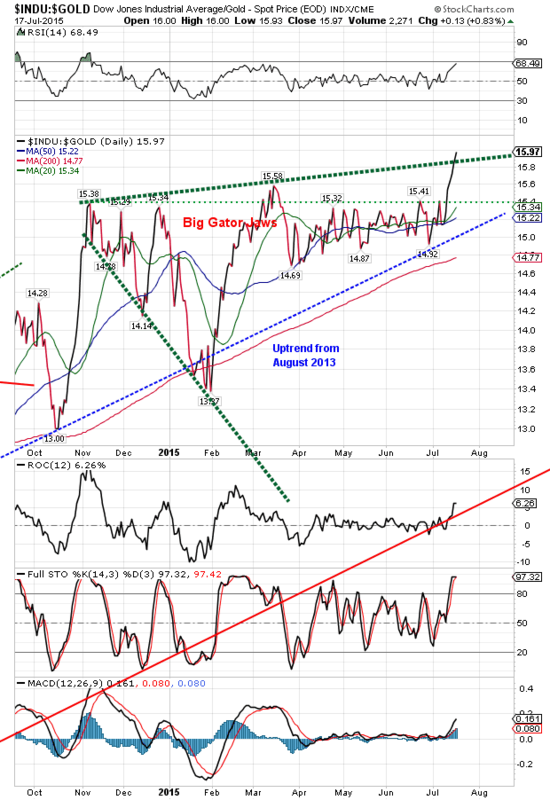 Higher dollar will blow a headwind against commodities and gold and silver, but don’t be fatalistic. A risin’ dollar ain’t the only thing happenin’ in town. But a risin’ dollar’s sure pizen to the euro, as if it took much pizen to kill anything that sick. Today the euro lost 0.31% to $1.0846. This Greece mess makes it plain that the swoll up bureaucrats runnin’ Europe have finally lost their minds. They think they’re about to gobble Greece whole, but they are likely to choke on a bone no Heimlich will dislodge. Japanese ain’t about to choke on a bone, cause they chop everything up and eat it raw. Yen gained 0.5% to 80.60, while its chefs in Tokyo just keep chopping it up into little bitty sushi. Dow in gold is testing the outer limit of how wrong I can be. Closed today at G$330.13 gold dollars (15.97 troy ounces), 2.5% above the March high. Chart is on the right. Dow in silver closed the week at S$1,578.96 silver dollars (1,221.23 troy oz). Does that wreck the pattern and foretell stocks rising against silver (and gold) forever? Well, wait a little. 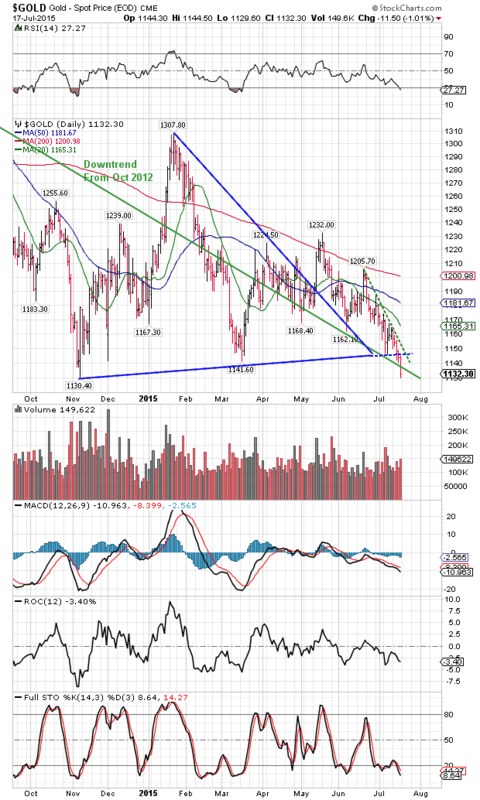 This is just about when silver and gold ought to be making lows, and nothing’s happened to make the US economy or stock market any more attractive than it looked six weeks ago. Just wait till next week and see. 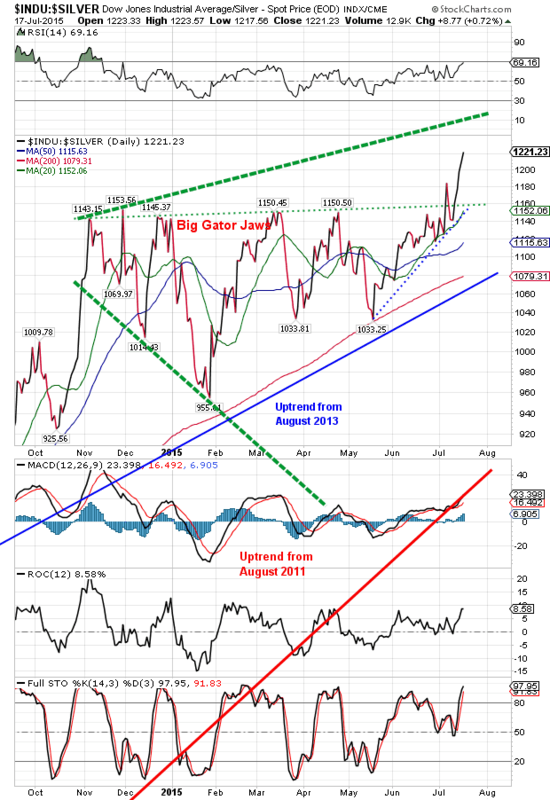 Dow in Silver chart’s on the left.